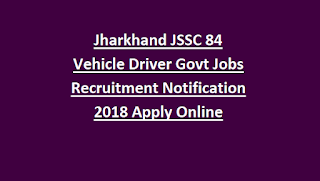 Vehicle Driver Posts through online official website of Jharkhand Staff Selection Commission is www.jssc.in. The online application forms will be available from 18-10-2018 onwards. The last date to submit the application form with relevant documents is on or before 23-11-2018. The candidates will be shortlisted on the basis of merit in written exam. For more details of age limit, salary, application fee, exam pattern and syllabus and how to apply are given below for the Vehicle Driver posts Recruitment Notification 2018. The age limit for the candidates applying for the Vehicle driver posts is in between 18 – 35 years. The educational qualification for the Vehicle Driver posts is candidates should have done 10th/ LMV, HMV Vehicle Driver Legal License. The salary offered for the shortlisted candidates is Rs.5200 – 20200/- with Grade Pay Rs1900/-. The application fee for the candidates belongs to General/OBC category is Rs.800/- for SC/ST/Ex-s/PWD is Rs.200/-. The candidates will be selected on the basis of merit in written examination and skill test and Interview. 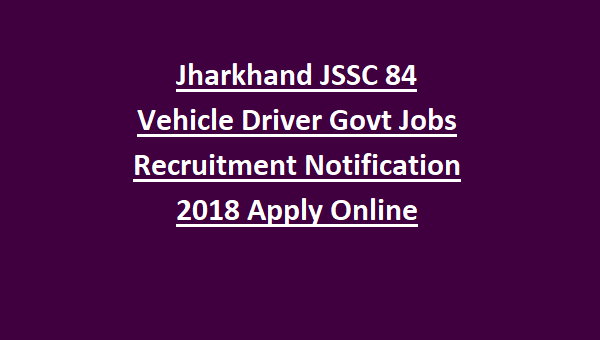 Interested and eligible candidates can apply for the Vehicle Driver Posts through online official website of Jharkhand Staff Selection Commission is www.jssc.in. The online application forms will be available from 18-10-2018 onwards. The last date to submit the application form with relevant documents is on or before 23-11-2018. For more information candidates can check in the official notification of JSSC.